Colin Kaepernick is one of the faces of GQ's December issue. 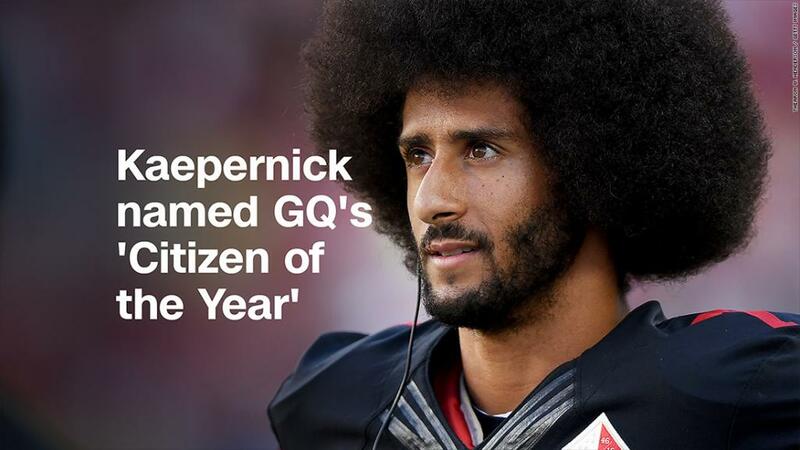 The magazine named the former 49ers quarterback its "Citizen of the Year" for starting the protest that became a movement in the NFL. "He's been vilified by millions and locked out of the NFL -- all because he took a knee to protest police brutality," GQ wrote in a news release about the cover. "Colin Kaepernick's determined stand puts him in rare company in sports history: Muhammad Ali, Jackie Robinson -- athletes who risked everything to make a difference." Kaepernick has been on the cover of GQ before, but for his athletic skill. Now he's on the cover because he's not playing. "And it's not because he's hurt, or because he's broken any rules, or because he's not good enough," GQ said. "Approximately 90 men are currently employed as quarterbacks in the NFL, as either starters or reserves, and Colin Kaepernick is better -- indisputably, undeniably, flat-out better -- than at least 70 of them." Kaepernick is not interviewed for the issue but appears in a photo spread. GQ said he agreed to participate because he wanted to "reclaim the narrative of his protest, which has been hijacked by a president eager to make this moment about himself." "I see what he's done as art. I believe that art is seeing the world that doesn't exist," DuVernay said in the article. "I think some folks see his protests, his resistance, as not his work. Not intentional. Not strategic. Not as progressive action. As if this was just a moment that he got caught up in. This was work. This is work that he's doing." Kaepernick said on Twitter that he was "honored to be recognized."